Myths and fads are rife in the world of dieting, and one of the most common misconceptions is that cutting carbohydrates is the key to successful weight loss. For refined and processed carbs, this may be true, but there are different types of carbohydrates, and while some may contribute to weight gain, others are likely to prevent it: it's all about choosing healthy sources. Keep reading to learn more about carbohydrates, discover how excess consumption of the wrong carbs is affecting your diet, and discover why not all carbohydrates are enemies of weight loss. Carbohydrates are the most important source of energy for the body. The digestive system converts them into a sugar molecule called glucose, which is carried in the bloodstream to provide energy to cells. Carbohydrates come in two forms: simple and complex. Simple carbs are the sugars naturally found in fruit, vegetables, and milk products, and those found in refined or processed foods that have sugars added, such as cookies, cakes, and chocolate. Complex carbs include starch, whole grains, and non-digestible dietary fiber. While the body breaks starch down into sugars to convert into glucose, it passes fiber through the digestive system without breaking it down. Does Cutting Carbs Help with Weight Loss? It's a myth that simply cutting carbs from your diet is the most effective way to lose weight. Carbohydrates are the primary energy source for the entire body, and omitting them completely is likely to leave you feeling tired, weak, and hungry. Cutting carbs reduces the body's ability to process them, making digestive issues, bloating, and weight gain more likely when they are inevitably reintroduced. In addition, cutting carbohydrates invariably means reducing the intake of the important nutrients carbohydrate sources provide, like antioxidants, beneficial phytocompounds, and fiber. Lowering your intake of refined or processed carbs is likely to help with weight loss because, while calorie-laden cakes, sweets, and sugary sodas provide immediate satisfaction and energy, these effects are short-term. 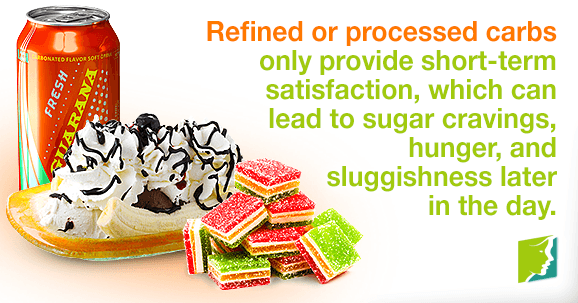 It's common for their consumption to lead to sugar cravings, hunger, and sluggishness later in the day. In terms of carbohydrates, dietary fibers, found in whole grains, brown rice, and oatmeal, are the way to go. These help eliminate excess fat in the intestines and push food through the intestines, promoting healthy digestion. Fibers also remain in the stomach for longer than other carbohydrates, helping to sustain a feeling of fullness for longer. Complex carbohydrates from whole grains can also help with weight loss and diabetes prevention. They have a low glycemic index, meaning they are absorbed more slowly, promoting a feeling of fullness and preventing blood sugar spikes. The simple carbohydrates found in fresh fruit and vegetables are the healthiest way to satisfy a sugar craving, as these tend to contain plenty of vitamins, fiber and no saturated fat. Fad diets may result in short-term success, but the likelihood of maintaining extreme diet plans in the long run is doubtful, not to mention damaging to your body. Following a balanced diet that incorporates nutrients from all the food groups is the solution for long-term weight management and - provided the sources are healthy ones - carbohydrates should feature in this, too.